Google Maps application for iOS in the Apple Appstore crosses more than 10 Million downloads in just 48 Hours of release of the Application. This news is no shocking as it has been known that Maps in iOS 6.0 has so many complications and uneasy to use. This became a plus point for such huge number of downloads for the Google Maps App. On top of this, Just after few days of release, Google Maps for iPhone turns out to be one among the 'Top Free Apps' in the Appstore. 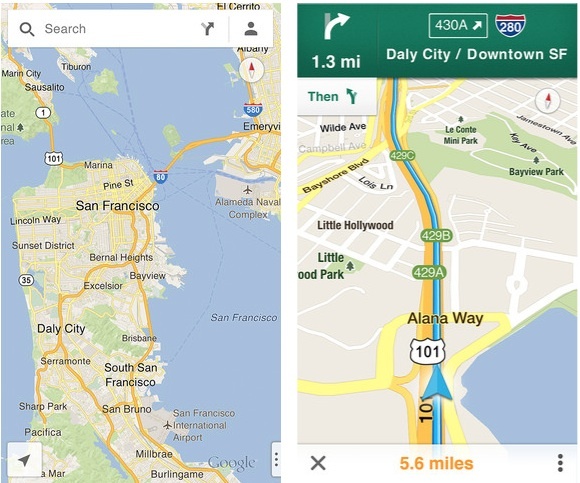 Google's senior vice president of Commerce and Local, Jeff Huber posted in Google+ "We're excited for the positive reception of Google Maps for iPhone around the world." Users can know the full review of Google Maps App for iOS Here. Users can Download the Official Google Maps App for iPhone Here. Google Maps for iPhone Video by Google Maps.